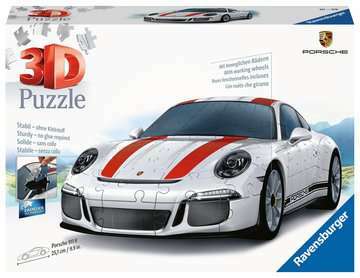 Anyone who has a soft spot for the coveted Porsche 911 R will hardly be able to escape this iconic 3D puzzle. The legendary 911, built in 1967 for racing and reissued in 2016, comes in a true-to-life 1:18 scale design with classically elegant lines. This 3D Puzzle is an automotive experience that will make the pulse of racing enthusiasts beat faster. The 108 sturdy plastic puzzle pieces are individually shaped to fit perfectly together thanks to our EasyClick technology. The pieces click together without the need for any glue. Accessories including the rotating wheels, provide the final touch to this stunning display piece.